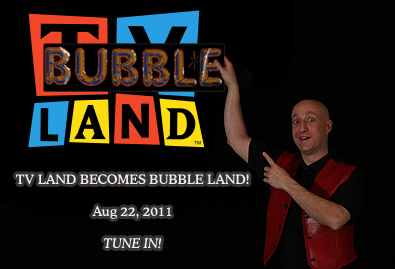 TV LAND BECOMES BUBBLE LAND! Bubble Artist Casey Carle hosted by Hershey's. Casey Carle was invited to be a guest artist on TV Land's "Best Night In", an established marketing concept on this Viacom-owned cable channel in where they air entertaining and informative video segments during breaks in programming on special nights in the year. Mr. Carle joined veteran host Leila Sbitani under the hot lights in the TV Land studios on King St. in lower Manhattan. The two of them had fun together bubbling, joking and eating the sponsor's chocolates. A total of four one-minute segments will be aired August 22, 2001 between the hours of 9 -11 p.m. In two segments, Mr. Carle was asked to demonstrate his skills with soap bubble sculpture and manipulation, exciting Director Dave Herman with visually stunning images and causing quite a stir with the studio crew who had never before seen anything like it! There is a segment where Mr. Carle teaches some basic bubble art to potentially millions of viewers, creations they can easily reproduce with simple tools at home. The fourth segment focuses on commercially available "tools of the professional bubble trade" that Mr. Carle endorses in his stage show and on his website (www.bubblemania.com). The segments were sponsored by Hershey, who's representative in the studio seemed quite pleased with the bubble talents shared on this project, expressing her excitement with how Mr. Carle's unique skills would "wow" the viewers and motivate them to stick around to see how they, too, could do amazing things with bubbles. Mr. Carle hopes viewers will be aided in their endeavors with his celebrity-endorsed bubble solutions and toys, with which mesmerizing bubble art and giant soap bubbles can be obtained with relative ease. From TV Land to Switzer-land and back home to New Eng-land, Casey Carle continues showing the world on both stage and screen that soap bubbles are not just for popping anymore! * About Best Night In: Make the most of movie night! Best Night In is all about taking your downtime to new heights. Enjoy the TV Land programming and during the breaks our host and special guests will bring you fresh new ideas for maximizing your domestic fun. Sit back, relax, enjoy the movie, and let TV Land help you make it a Best Night In!